Nest’s indoor security cameras are some of the most popular cameras on the market. And for good reason—they’re attractive and incredibly easy to use. We’ve tested both the original Nest Cam indoor and its successor the Nest Cam IQ and we’re happy to report that both cameras are excellent pieces of hardware. You won’t go wrong with either camera, but they’re not flawless—and at about $200–$300 a pop, they’re a bit of an investment. So, before you spring for one (or a set), check out our review to make sure you pick the version that’s best for your home, lifestyle, and budget. *Standard retail prices as of 1/9/2019. Prices and availability are subject to change and can vary by retailer. Before you invest in either Nest indoor camera, there are a few pros and cons you’ll want to consider. Nest cameras require Nest Aware subscription to access some of the camera’s most useful features. Without Nest Aware you get only three hours of snapshot history (the clips captured when your motion sensor goes off). If you want more cloud storage and video history you’ll need to pay for a Nest Aware subscription. Five days of video history: $5/mo. 10 days of video history: $10/mo. 30 days of video history: $30/mo. Continuous video recording: Instead of saving clips only when the motion sensor is triggered, the camera records all the time, so you can check your video history even if nothing sets off the motion sensor. Custom activity zones: Need to pay special attention to a certain area? Draw your own custom zones to get notifications if there is motion in a specific spot. It’s especially handy if you’re trying to keep kids or pets out of a dangerous area like the kitchen or home gym. Person alerts (for the original Nest Cam): Person alerts are already included with the IQ cam, but if you’d like to add them to the original Nest Cam, you’ll need Nest Aware. Facial recognition (For Nest Cam IQ): With Nest Aware, the IQ cameras can learn to recognize familiar faces and let you know when someone specific comes in to a room. Unfortunately, this feature isn’t available for the original Nest Cam. 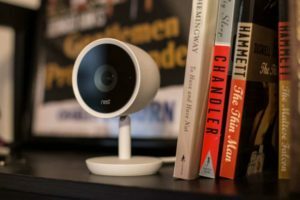 The original Nest Cam Indoor is a few years old, but it’s still one of the best indoor security available—especially if you want an inconspicuous camera that won’t distract from your cute interior design flourishes. It has all the basics you’d expect from a security camera including night vision, motion detection, and live video feed through a mobile app. Plus, it comes with a built-in stand and a magnetic mount, so it’s easy to place it wherever you’d like whether you’re using the camera to prevent midnight fridge raids or keep curious pets out of the storage room. Size: 4.5 x 2.8 x 2.8 in. The Nest Cam Indoor gives you all the standard things you’d need from a security camera but doesn’t add any features that are particularly flashy or exciting. But there’s nothing wrong with the basics—especially when everything works well. This little camera is good at picking up motion—maybe too good. I got notifications when my cats wandered in and out of the room and when they tried to parkour off the TV. It also caught every time someone came in and out of the apartment. I was curious about how it would do through the window, so in one of my tests, I left the blinds open in my front room. The camera noticed and sent notifications when my neighbor walked past. The camera noticed and sent notifications when my neighbor walked past. The sensitivity could be a bit annoying, but if you want to keep a close eye on kids or pets, this camera isn’t going to miss much. This camera’s sharp video feed lets you see what’s going on in your home. The night vision is clear, so you’ll still have a good view even when it’s dark. I tested the audio on this camera by playing music while it was recording. When I played the video clip, you could still hear the music and tell what was playing. The speaker is also crisp, so if you use the two-way audio feature to speak to someone in your home, they should be able to hear you clearly. You’re not going to need your tool set. Just download the Nest app, scan the QR code, set the camera on a high shelf, and plug it in. One of the Nest Cam’s biggest selling points is how easy it is to set up. You’re not going to need your tool set. Just download the Nest app, scan the QR code, set the camera on a high shelf, and plug it in. The app walks you through the rest of the setup process. The cameras have QR codes on them, so once you scan the code, the camera is quickly added to your account. All told, I spent about 15 minutes downloading the app, setting up a Nest account, and getting the camera configured the way I wanted. Placement options are a bit limited because the camera needs to be plugged in, but the cord is long, so we don’t expect placement to be a major issue in most homes. The original Nest Cam Indoor costs about $200 (although there’s a decent chance you can find it at a discounted price). This puts it right alongside cameras from companies like Ring and Arlo. If you’re looking for something less expensive, check out Blink or the Amazon Cloud Cam. The Nest IQ indoor camera is quite a bit larger than the original Nest Cam. It’s much more noticeable than the original camera, but it still looks nice on a shelf. The IQ camera uses that extra space to include a larger image sensor, higher-quality speaker, and more microphones to provide noise canceling and echo suppression. The Nest IQ indoor camera also includes a built-in Google Assistant. These improvements mean the IQ costs more, but if you’re looking for a higher-quality camera—it delivers. Size: 4.9 x 2.9 x 2.9 in. 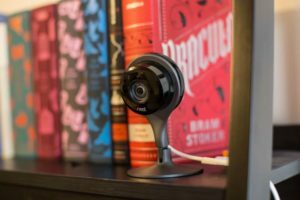 Nest stepped up its game with the IQ cam. It’s loaded with high-end tech that gives you lots of options for customizing the camera to your needs. The built-in Google Assistant is one of this camera’s most unique features. And while it’s not necessary, it’s super handy if you don’t already have a smart speaker or if you’d like to add another to your lineup. I used it to set timers while I was cooking, check the weather when making plans, and ask about traffic before heading to work. According to Nest, the IQ cam’s speaker is seven times more powerful than the speaker on the original Nest Cam. While I didn’t notice anything dramatic, the sound was sharp, and the speaker worked very well. The IQ cam also has more microphones than the original Nest Cam. These mics help with noise canceling and echo suppression to make sure you can clearly hear audio when you’re checking your camera feed. The improved two-way audio makes this camera a smart choice for parents who may be using the Nest IQ to check on older kids who are home alone. Once the Nest Cam IQ notices motion, it zooms in on whatever is moving and follows that movement around the room. This makes it easier to see exactly what is going on and get a clear view of who’s moving around in your home. Nest IQ cameras can tell the difference between a person and a thing. Nest IQ cameras can tell the difference between a person and a thing—helpful whether you’re worried about intruders or making sure your kids got home from school when expected. The Nest IQ is just as easy to set up as the original Nest Cam—download the Nest app, pick a spot for the camera, plug the camera in, and follow the app’s step-by-step instructions. The app also walks you through setting up your Google Assistant. It took me about 25 minutes to get the camera up and running, but many of those 25 minutes were spent scouring my apartment for a paper clip—I was testing a camera that had been used before and it needed to be reset by pushing the teensy reset button on the base of the camera. Once I reset the camera, everything went smoothly. There’s no way around it—at about $300, the Nest IQ Cam indoor is expensive. If you’ll use all the high-end features (Google Assistant, two-way audio, person alerts), it’s worth the price. But if you just need a basic security camera, you’re probably better off getting the original Nest Cam to save money. We’d happily recommend Nest’s cameras to anyone looking for an indoor security camera. We think most people’s needs will be met with the original Nest Cam Indoor, but the extra features included with the Nest Cam IQ are worth it if you have the budget. Also interested in outdoor security? Check out our review of Nest’s outdoor cameras. This camera sounds like it could be great as a baby monitor. I guess the only downside would be having to pay for the storage subscription. Would you recommend this camera to be used as a baby monitor?